Don’t watch this series. You will hate it. Why? Because its ONLY 9 EPISODES LONG!!! From the amazing people who brought you one of the best American animated series of all time, Avatar: The Last Airbender, comes an epic high fantasy with dragons, elves, magic, and a heaping dose of so cool. 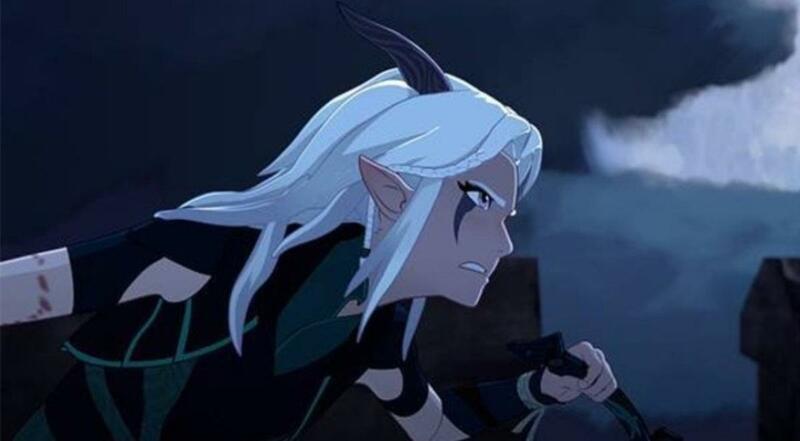 Rayla, a Moonelf assassin, is sent to kill the young son of King Harrow, Prince Ezran. She botches the mission before ever arriving and is dismissed from the assassin squad. In an attempt to rectify her mistake in the eyes of those she has accompanied to human lands, she sneaks into the castle anyway. 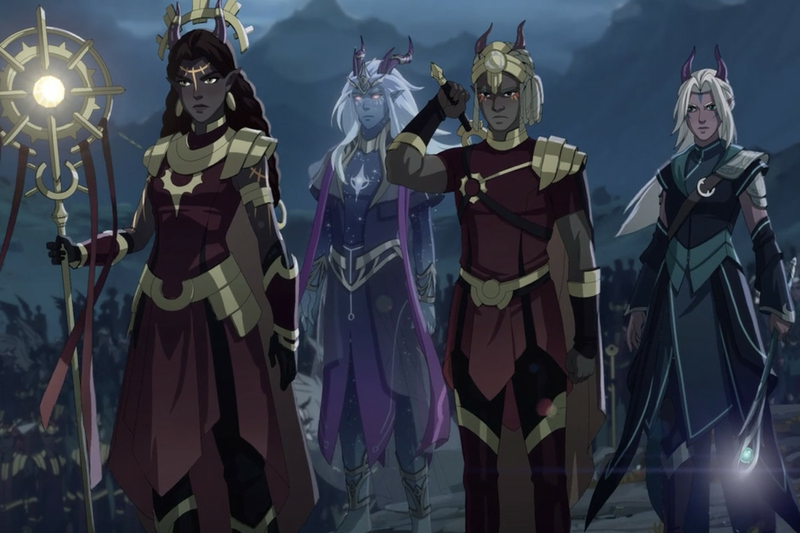 While the other five members of her team – all older, more experienced Moonelves – work their way toward King Harrow to take him out, Rayla seeks out Ezran to complete her mission on her own. Along the way, Rayla stumbles across Callum, the stepson of Harrow. As she chases him through the castle, Ezran finds Callum and leads him down into the secret chamber of Viren, the court mage. There Ezran shows Callum a dragon egg, the only egg of the Dragon King whom the humans slew in their war against the elves and dragons. Rayla finds them and sees the egg and has a change of heart. Instead of killing Ezran, she becomes a kind of guardian over the two boys as they seek to return the egg to the Queen of the Dragons and stop the war. Thus begins the adventure. Throughout the show, we meet other interesting characters out of whom I simply cannot pick a favorite. Claudia is Viren’s daughter, an extremely intelligent mage in her own right, with a very cracked sense of humor. Her brother Soren reminds distinctly of Sokka from Airbender. General Amaya, the mute Aunt of the human princes, sister to their mother is commander of all the human forces at the battlefront. Several others come along throughout the journey and all are likable in their way. Even the old vet they meet in episode 7 was immediately likable. At the risk of sounding like I’m gushing (I don’t get paid to write these reviews anyway), everything was good. I don’t have quite enough data to say it was better than Airbender, but it’s definitely got the potential. I would definitely argue that it’s better than Legend of Korra. The art style is unique and beautiful. It uses three-dimensional computer animation, but cel-shading and a reduced frame rate are applied to make the action resemble traditional two-dimensional animation. The voice acting is great and the actors really do a superb job of bringing these characters to life. Above that, the writing is superb. There is humor woven into the tapestry along with dark themes to strike a great balance even younger viewers will appreciate. Claudia’s humor is probably my favorite, and her dark streak counterbalances it flawlessly. There is depth to the story, a solid plot, deep characters with well thought out interconnections. Even the main “bad guy” is complex. I found myself rooting for him to overcome that darker side even as he slid further into it. I wanted him to become the “brother” to King Harrow that he claimed to be at the beginning. In fact, I believe he believes himself to be just that, though his methods in showing it are brutal. World-building, as always, is my favorite part of stories, especially epic fantasy. 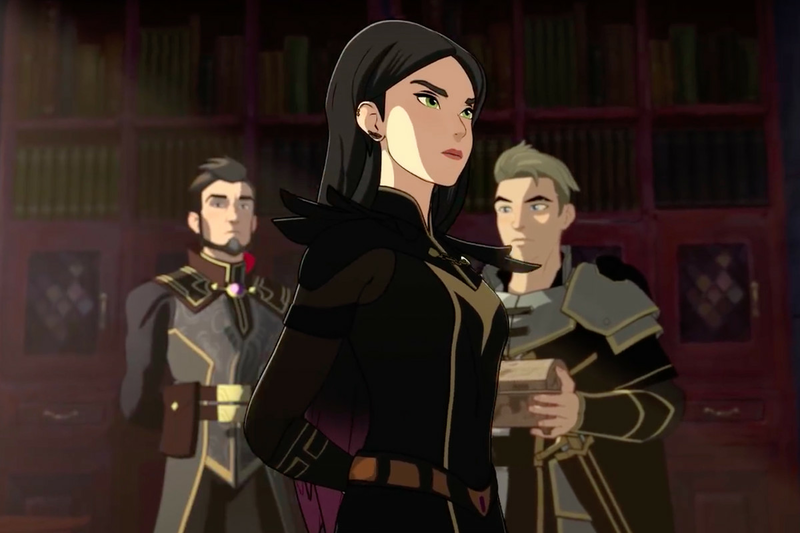 Dragon Prince does not fail me here. There is a huge setting that we only catch a glimpse at in this first season. Magical creatures both old and never seen before. Even the magic system itself is complex and plays an interesting, integral part of the story as young Callum discovers that he is a mage. Did I mention that Season 1 is only 9 episodes long? Well, my twins (almost 9 now) and my youngest (4) love it. I love it. I bet my wife, who isn’t really into my ‘cartoons’ will love it – she loved the Last Airbender. What better recommendation is there? Truly, the series is entertaining for all ages and if you like animated shows even a little, stop binge-watching whatever else you’re slogging your way through and watch this. You will not be disappointed (or we can’t be friends). We’ve only seen nine episodes, but within that, the creators have presented a rich world with hints at interesting gaming mechanics. The magic system is well defined within the story and I believe could port to analog gaming pretty seamlessly. Furthermore, the creators have written varied races and given us a well established political system. Even a monster roster has been started. I am looking forward to more episodes, certainly, but I think I’m just as interested in seeing more content that I can game with. 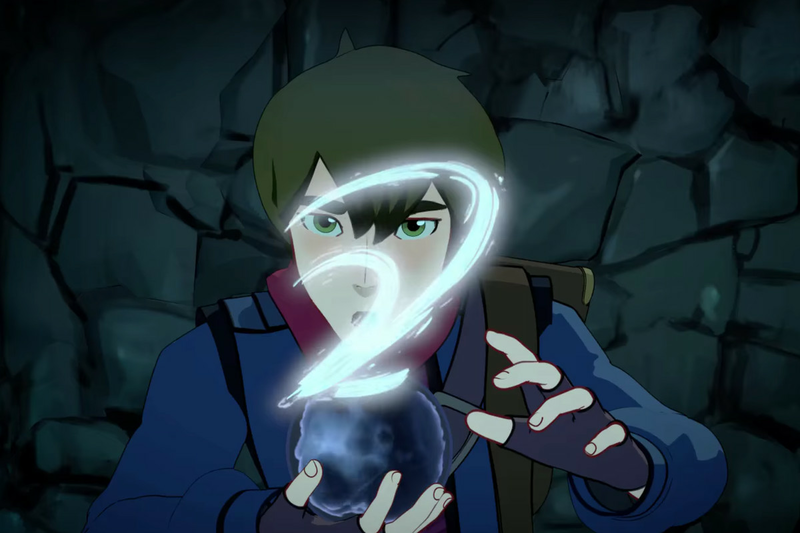 I like that you mentioned how The Dragon Prince might apply to analog or table top gaming. What game system, that most people have heard of, do you think would work well with this show being the basis for the game world? I think you could adapt any d20 system pretty readily to this with only a few modifications. You’d need new racial templates for the various elfin factions. Then you’d have some specific requirements from the material and verbal components as seen in the show. Other systems would work as well. Pathfinder, GURPS, Fantasy Hero from Hero Games, Ars Magica, BESM, and that’s just a few that I have played in and could adapt this world to. Some will work better than others, but that’s going to depend on what you prefer and are familiar with.